The 20-year celebration of Aktion Ladakh Kindergarten School was celebrated in collaboration with two other similar schools of Nimoo and Spituk on 17 August at Phay. The founder of Aktion Ladakh, Dolma Tethong, was present on the occasion. The chief guest was Executive Councilor for Education, Dorje Motup, while Punchok Dorjey, Councilor, Phyang, was the guest of honour. The Phay kindergarten was started in 1997, while the ones at Nimmo and Spituk were started in 2002 and 2004, respectively. The main objective in establishing the kinder garden schools was to help the children grow properly in village environment. Dr. Nawang Tsering educationist, said that the Phay kindergarten was the first of its kind. The motive of opening such nursery school at Phay village was to retain village children within their village and to develop their personality in home atmosphere, learning not only modern subjects, but also domestic activities like helping parents in the fields. Dr. Tsering Norboo, Convenor, Aktion Ladakh, gave a detail presentation of the school report and briefed about the aims and objectives of kindergarten school system. He said, “I have been associated with these three kindergarten schools for a very long time and I have seen the ups and downs of these schools. In the last 20 years, the villagers and the teachers have really worked hard”. There are three principles of these kindergarten schools which are to impart joyful learning, concept-based learning and people’s participation. Dorjey Motup, EC, Education, assured to replicate the kindergarten system of education in all the pre-primary nursery government schools. He appreciated the contribution made by Aktion Ladakh. He said people’s participation is equally important to make this kind of schools successful. Dolma Tethong, founder, Aktion Ladakh, said, “Our volunteers have well-trained the teachers in such a way that now they can teach other teachers too. Many volunteers have visited and dedicated their time to make these schools a success." A book on the achievements of Aktion Ladakh was also released on the occasion. 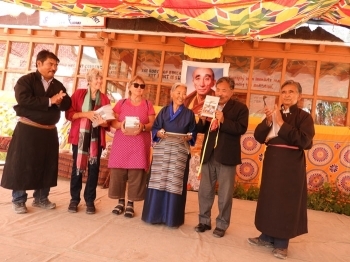 Dolma Tethong and Margrit Waelti, Secretary, Aktion Ladakh, were facilitated for their support for 20 years. The teachers of Kindergarten Phay, Nimmo and Spituk were also given certificates for their good work. Punchok Dorjey, Councilor, Phyang, guest of honour, urged Aktion Ladakh to adopt more schools in Ladakh. Tsering Motup, Nambardar, Phay, presented the vote of thanks. A cultural programme was presented by the students of Phay, Nimoo and Spituk schools on the occasion.